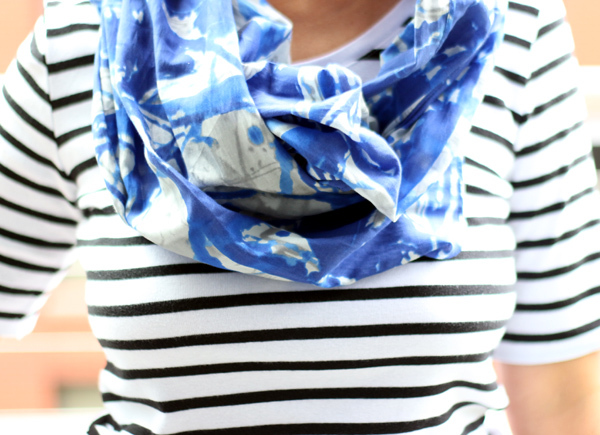 One of my latest favorite thrifted items is this blue and grey Vero Moda scarf. It goes with black, white, blue, grey, green and even stripes. I put it on once a week. I have a ton of thrifted scarves, but very few that aren't from the 1990s. Which might be the reason I rarely wear a scarf. For modern blue scarf hunters, here's a similar one from ASOS for $12. H&M also has a cool watery blue scarf for about $14. In other news, H&M finally opened its doors at Fulton Mall. The store is orderly, well air conditioned and brimming with product. (Those of you who have shopped at H&M in Manhattan will know these are rare attributes.) We are stilling waiting on our TJMaxx, which I predict will be a hot mess in the literal sense. What cool stuff have you found lately? Yeah, save the scarf for January. I bow down to your uncanny ability to find the gems in a sea of crap at the thrift store. Any tips you can share? Love the scarf :) Jealous, I wish they would bring H&M to New Zealand! H&M just started E-commerce in the US! Hope it applies to NZ as well. that's a pretty cool scarf! I love those colors, they're so easy to wear!